Many of you know I spent a good chunk of the past year away from the search industry, recharging my batteries and trying to gain a little perspective on how to align my professional passion (helping small businesses thrive) with my expertise (digital marketing for said businesses). Part of that exercise was analyzing the position of local SEO in the context of Google’s strategic moves over the past three to four years, and this year’s predictions are based on that extended analysis. Mobile payments and content marketing gain adoption among SMBs, while the market frenzy around loyalty programs starts to subside. Email marketing makes a comeback, while big competition develops for on-demand home services. Store locators/location pages, citations, reviews become table stakes, while brand and customer engagement become competitive difference makers. Bonus: Beacons fail to get off the ground because they don’t solve a consumer problem. My 2017 predictions are less conservative than those I’ve made previously, but it feels like we’re going to see a huge year. My only hesitation is whether we’ll see it in 2017, or it might be 2018-19 before we really start to see the effects I detail below. Regardless of the timing, the pressure’s on more than ever to be right! I’m putting my money where my mouth is and launching an entire new company in 2017 on the basis of what I outline below. You can be the first to know about it here. Here’s my view of the local search landscape in 2017, and my advice on maintaining a fighting chance at being that first result on Google. More mobile clicks for commercial local keywords will go to paid results than organic by the end of 2017, partly to the new chimera ad units we’ve already seen in the home services vertical, and partly to traditional Adwords enhanced with things like reviews and location information. Organically, we’ll see widespread single-answer Knowledge Graph results across an even broader range of keywords, and voice queries will return only the top-ranking business. Meaning the number of available slots, even for well-optimized websites, will drop precipitously. Google will double-down on the presentation of web content within search results, not just for recent news articles, but for all kinds of content. Businesses lucky enough to rank organically for high-value terms will see fewer and fewer website visits coming from Google as attribution becomes the new clickthrough in voice search. After years of shrinking due to the pain point of typing on mobile devices, the average keyword length will get longer from here on out as more people get comfortable asking natural-language queries via voice search. The trend toward personalization will accelerate with all the additional data Google gathers from Home and Pixel phones. The variation in result types and positions across specific keywords and locations for specific users makes any tracking of individual keywords pure folly. Late 2017 will be a tipping point of sorts for a substantial segment of small businesses, who have historically done well with SEO but not dominated their market. They’ll begin to realize that the return on their historical investment is diminishing, even if their rank tracking software says they’re maintaining or even improving their organic positions. For my entire career, local SEO has been the low-cost, high-return marketing option for the overwhelming majority of small businesses. We’ve seen the practice get harder over the last three to four years, but the size of the market has grown as awareness and demand has increased among local businesses, and many of Google’s moves such as Venice actually accrued to the organic benefit of local businesses. But for the reasons I laid out above, I think those businesses who rely on SEO, and as a result the SEO industry itself, is in for a very rough ride over the next three to four years. The few companies that succeed in the new rich snippet/voice search paradigm are going to be rewarded, for sure. But for many local queries we’ve gone from 10 blue links to one Knowledge Graph result in the last 10 years, sometimes placed below four ads. That’s a 90% decrease in the number of businesses who’ll see meaningful benefit from their organic search position, and the competition for that remaining spot is stronger than it’s ever been. Demand will remain strong among (late-adopting) small businesses. But even with properly tempered expectations, many of those clients are going to be frustrated when the techniques and strategies you’ve honed over the last 10 years aren’t returning anywhere near the results they used to. 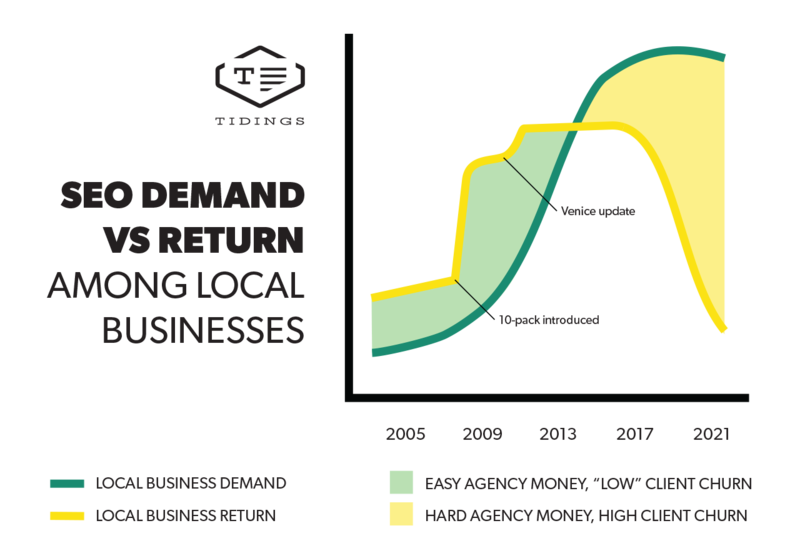 As a small business, or as a search-focused agency serving local businesses, how can you adapt? I’d be watching Dr. Pete’s research like a hawk, and augmenting it with several hours of my own, every month. The goal is to become intimately familiar with how publishers like this and this and this are earning snippets for competitive, commercial local keywords–even if these aren’t industries or markets that you or your clients serve. Even if you’re not a publisher in the traditional sense of the word, you should prepare for a time when no one ever visits your website. Awareness, research, and conversion will all happen in search results, and the companies whose websites facilitate that paradigm on the leading edge will be rewarded with more customers while competitors scramble to catch up. This means as much Schema.org and JSON-LD markup as possible, and partnering with third-parties that have cut deals with Google to facilitate transactions (see: OpenTable and ZocDoc). Pay particular attention to how you can attract traffic from mid-tail terms on mobile devices. At the very least, it’s likely you’ll need to augment the organic traffic your SEO efforts used to supply your clients. And even if I’m completely wrong about everything above, you’ll be providing your clients with an additional service benefit. Savvy businesses–or at least those represented by savvy agencies–will shift more and more resources towards SEO on other platforms including Facebook, Siri, and Alexa, which relative to the investment will drive higher returns than traditional SEO focused on Google. For areas where you might think about positioning yourself, see Part II of my 2017 predictions. With regard to the observation and prediction(s) that as of 2017 there will be more google mobile clicks to local businesses on ads or the paid results for home services….Google Mobile is an advertising medium, not a search engine. Years ago google stated that they weren’t going to do this. Google gained its popularity because it gave valid search results as a search engine. Not anymore. In our own cases we are seeing close to 50% of clicks on mobile coming from adwords, simply an astounding level. Our visibility is very strong in both adwords and search…but who sees search results anymore…its all advertising above the fold. We all need a new SEARCH ENGINE. not an ad engine. Any governmental regulators listening in here??? Spot on. Organic seems to be getting obsolete. It seems sometimes that we have all contributed in some way to this Information brain called “Google” who have now said “Thank you very much”, walked away and are now counting the money only. I appreciate the sentiment, but Google is able to get away with serving ads because the top-spending companies usually offer excellent customer experiences. “The top-spending companies usually offer excellent customer experiences.” Oh man. I think if Google can keep people away from local business websites and convert people directly on the SERP, they’ll take that opportunity. So many websites are unfortunately still not mobile-friendly, let alone mobile-optimized, which seems to be true no matter how much you spend on Adwords. I mean experiences overall, not necessarily user experiences on the web. Put another way: The top-spending companies are usually the companies that are well-managed and making money. These companies usually do a good job of providing good service. Also, agree that lead gen is Google’s next frontier…only it seems like they backed off that this year when they killed some tests they were running. Thanks David. I agree with you that as Google has matured and become a public company, their commitment to quality as opposed to ad revenue has been inversely related. Glad to see someone “in the weeds” is already starting to validate my prediction of mobile adwords percentages. This is excellent. You’re coving some thoughts I’ve been having lately, and many more that I haven’t. The biggest one has been “DIVERSIFY YOUR PLATFORM FOCUS.” To your point “I think those businesses who rely on SEO, and as a result the SEO industry itself, is in for a very rough ride over the next three to four years,” we have already seen what Paid results are doing to the SERPs (specifically in 2015 & 2016). I then project out that trend into the device fragmentation with the IoT getting bigger everyday, and wonder if SERPs will soon become a thing of the past, or at least as we know them now. We saw a quick shift in mobile vs. desktop (once the industry really started paying attention to it), and as AR and the IoT continues to emerge, how will that play into the way we get information in the next five years? I think the shift from mobile as the dominant device may be closer than we think. I’m very interested to follow Tidings, and wish you the best of luck! Thanks Tony, I appreciate your thoughtful response and your best wishes! To be clear, I think there’ll always be a place for desktop/visual search but it’s going to be a smaller piece of the pie and the organic real estate available will also continue to get smaller. Your analogy to how quick the mobile revolution took place is spot-on, and I think there’s a bit of Moore’s Law that will play out with Voice…it’ll gain mass adoption in half the amount of time as mobile did. Very interesting – thanks as always for your great insights. However, I don’t think you’ve given Facebook nearly enough importance. It’s rapidly becoming the go-to ad platform for anyone with a small budget, and from what I’ve seen it’s a good place to spend money. While it will never quite be as good as AdWords for ‘making the phones ring’, it should offer a lot of low cost leads for the foreseeable future. EDIT: Presuming of course, FB ads are targeted and managed correctly…we’re definitely going to see a lot of evolution in tactics and technique as the platform becomes more popular with small businesses and local agencies. I couldn’t agree more — Facebook ads are THE first place I’d start with online advertising…as I hint at here and also in my recent conversation with Mike Blumenthal on Street Fight. Not sure how low-cost it’ll stay as more businesses start to advertise but for now, it’s definitely better than Adwords for well-run campaigns–and much quicker/easier to set up. I couldn’t agree more — Facebook ads are THE first place I’d start with online advertising…as I hint at tidings.com/stack and also in my recent conversation with Mike Blumenthal on Street Fight about the Essential Digital Marketing Bundle. Not sure how low-cost it’ll stay as more businesses start to advertise but for now, it’s definitely better than Adwords for well-run campaigns–and much quicker/easier to set up. If you are not in front of the curve, you are already behind the curve right? It’s not so strange to think that Google could become close to an ad only platform for local because Yellow Pages. In pre-Google days, people never thought for a second that they were getting screwed over by the YP because it was full of ads. After all the ads were of local business ready to help local people get what they needed. For sure, Google have been very bold in claiming the whole above the fold real estate for ads on mobile. I could easily see a time soon where services equipped with booking software will have the booking form in a snippet – that would be worth a local business paying for and make a customers life easier too. On the non-local side, (content) all of those very low quality 4000+ word “epic” content pieces are strangling humanity… byte by byte. The point being that Google has competition and for Google itself to stay ahead of the competition, it is continuing to refine its push for relevancy. And sometimes I reflect in wonderment that I get all of these leads for free. And I have wondered from time to time, if you took all of the local businesses in every market around the world, what would the combined value of that free advertising be? It doesn’t make sense to me because there are a LOT of businesses like mine that get so many free leads that they couldn’t service any more leads from ads or that have come to expect a steady stream of new leads for free and do not see the need to pay for more. In my case I stopped Adwords so I could grow at a manageable pace. Which means that Google’s willingness to give me leads for free has removed me from its own pool of paying advertisers. It doesn’t make sense for Google to do that to itself. The flip side of the coin is that there are still massive opportunities right now, for local businesses to get free leads from Google and in my view, local SEO is still king. As FB moves more businesses into its ecosystem through workplace apps, the accepted, or previously accepted advice that FB isn’t effective for local because it is where people hangout socially, not for business will become less true over time. David, I love your pragmatic approach to the changes because there will always be roles for people that can make sense of, and develop effective strategies to stay ahead of the curve. And those that do tend to move further up the value chain as they go! Thanks so much for stopping by and for your incredibly thoughtful comment. Congrats on building such a successful business! Now THERE is a brilliant business idea. Would require someone with deep relationships in Mountain View, however — and would likely come from one or more of their existing partners within Knowledge Panels. These are some great insights.